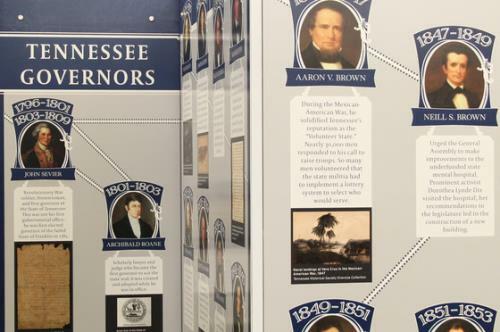 The Tennessee State Library and Archives announced its newest exhibit,Governors of Tennessee, in conjunction with the 2019 Gubernatorial Inauguration. Governors of Tennessee, opens to the public Jan. 8 and will run through spring 2019. The exhibit features information and materials from the Library and Archive’s extensive collections. Visitors will experience a visual timeline, with a special focus on each of the 49 governors throughout Tennessee’s history beginning with John Sevier (1796) and ending with Bill Haslam (2019). As part of the celebration, the Library and Archives will also display a curated selection of original archival documents. Exhibition cases present the personal papers and government record collections of many former governors. One display features correspondence with notable Tennessee celebrities including Elvis and Johnny Cash. The Tennessee State Library and Archives is located at 403 Seventh Ave. N. Free parking is available around the Library and Archives building. The Governors of Tennessee exhibit is free and open to the public Tuesdays - Saturdays, from 8 a.m. to 4:30 p.m.